Issue #184 • September 30, 2013•Buy Now! Doctor Adams shines things at me and into me. His hands are as swift as gears as he fastens a bright red helmet to my head. It’s wired to a large, square machine thrumming with inner current. Coronation, I think. King. Vestigial words. I should pay attention to what Adams is saying, but my head hurts more when I concentrate. The headache began yesterday, similar to the one from last week and those from last month, but it has gathered overnight, swelled into a giant. It towers over me, a homo sapien of pain. I’m a jellyfish at its feet. I nod as if I’ve understood Adams, and he goes to a corner, his back to me, and slips on a headset. The room smells like burnt pudding. “Relax, Alfred,” Adams says. “But try to stay alert.” His dreadlocks reach his waist. He has been growing and maintaining them for nearly twenty years now, as long as I’ve known him; they are as perfect as snowflakes. My hand drifts toward my downy, graying tufts, but they are trapped beneath this red dome. I shift in the hard chair, aware of how pathetic my vanity is. Amy Brill’s essays and short stories have appeared in Salon, Guernica, Real Simple, The Common, Redbook and elsewhere. She’s been awarded fellowships by the Millay Colony, the Edward Albee Foundation, Fundacion Valparaiso, the Constance Saltonstall Foundation and the American Antiquarian Society. Her first novel, The Movement of Stars, which she began in 1996, was finally recently published by Riverhead Books. She is a native New Yorker and currently lives in Brooklyn with her husband and their two young daughters. AB: I’m not sure. It began with the vision of Alfred catching Elleni deleting her memories, but all I knew is that she would kill herself that way and that they had a daughter who was now a teenager. The rest settled into place slowly, piece by piece. AB: Creating a world that doesn’t really exist—but almost exists—presented a unique challenge. I wanted Alfred’s world to be close enough to our own to feel familiar, recognizably human, even comforting—which would make its newness that much more startling. And then making that world cohere—getting the science right without going into too much detail. Making it believable, but not going overboard, was a writerly balancing act. HT: Your novel, THE MOVEMENT OF STARS, takes place on Nantucket in the 1800s. “ReMem” is set 20-30 years in the future. Was it difficult—or a relief—to jump from historical to sci-fi? AB: Oh, it was a huge relief. With the novel, after a certain amount of time it almost felt like some kind of Method writing, where I myself felt almost as constrained and meticulous as my characters. The language was formal, everything about it was so carefully crafted. This story allowed me to flex and leap in ways that were thrilling. And fun. HT: This story seems part social commentary, part love story, and part detective story, as Alfred tries to uncover the reasons behind his wife’s death. Was it difficult to balance these different elements? And did you know the exciting (and surprising) end when you began writing? AB: Ah, balance again. I think that’s what made the story so compelling to me—it had elements of so many things I’m interested in. Memory, aging, love, parenthood, how we define ourselves, how we tell our own stories—it was all in there. I think that’s why the story presented itself, as I worked on it, with remarkable speed. I didn’t consciously try to balance the parts; they emerged through these particular characters as I wrote. I did not know how it would end when I began. But when I got there I knew it was right. HT: The way that Alfred goes back over and over painful memories via ReMem & TreeMem reminded me of the way I lie awake at night, replaying events that have happened (and sometimes imagining alternative endings). Re-living memories in this way can be a way of processing them—and putting them to rest—or it can be an endless cycle of anxiety. 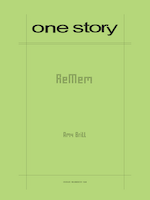 Can you talk a bit about the deeper implications of memory, and how you explore it in “ReMem”? AB: Memory is fundamental to human endeavor in every imaginable way. We can parse it emotionally, neuro- and physiologically, historically; our survival depends upon it, right? Where was that saber-toothed tiger’s cave? Which was the poisonous berry patch? What tribes persecuted and enslaved and expelled us? What is the meaning of these runes? That word? This song? What was the sky like when your sister was born? All of our human experience is filtered through memory. It’s how we learn and how we shape the story we tell about ourselves, as a species and as individuals. The idea of a shared consciousness is a radical, but not unimaginable, evolutionary next step that is bound to change humanity in profound ways. The only way I know how to examine something like that is through character, in this case Alfred, and how his relationships and his sense of self are affected by memory. He’s so vulnerable; his loneliness is so deeply human in this new world. What role do his memories play? Can they reveal something new? And I love how complex Lauria is, even with her teen-angst attitude. How deeply she lives in the present moment, how little use she has for memory, especially those random scraps of daily life—shopping lists, for instance—that clutter her father’s mind and Mempack. I could use some of the clarity and order she seems to naturally possess. HT: Another interesting aspect of the story is the notion of privacy and secrets—Alfred hides things from Lauria, and Elleni hides things from Alfred. Lauria, although she shares nearly everything online, is a mystery to her own father. Do you think it’s important for characters to have secrets? Or to connect do we need to “Upload All”? AB: I think the notion of individual privacy is something worth considering in the age we’re living in, to say the least. From a literary perspective, I’m interested in what we choose to shield vs. what we rush to share, and what those choices reveal about our interior lives. I think my interest in this comes from a kind of cross-generational place—my parents, for instance, were shaped by World War II rather than the Vietnam War or the counterculture here in America. My childhood was analog. I came of age just as computers were making their way into our culture, and I feel like I’m both a witness to and a participant in this enormous cultural shift taking place. I remember life before email and Twitter but these things are now seamlessly integrated into my life. I’m repulsed and fascinated by the impulse to reveal everything, show and tell everything, to everyone—it’s like cultural kindergarten, with everyone shouting “Look at me! Look at me!” But I resist the impulse to demonize new technology across the board. Every generation bemoans the habits and manners and moral fiber of the next. It’s just the way of things. But the kind of technology that occupies my thinking in this story has as much power to unite as it does to divide. The possibilities for growth and human transformation are dizzying. HT: Alfred’s relationship with his daughter Lauria is touching, and also a great representation of the distances that grow between each generation because of technology. Was “ReMem” inspired by facebook, twitter, and the surge of social media in the past ten years? And if so, do you think we are headed for a bodiless future? AB: I think we could be headed for a future in which life—or at least, consciousness—is much less limited by the body. I wouldn’t say that the story was inspired by social media per se—more by the leaps in technology like neuromotor prosthetics—brain sensors that allow paralyzed people to move or do things just by thinking about them. I really geek out about things like that. AB: I started it a long time ago but only wrote two or three pages. Once I found it and got going again, though, it only took about two months to write, rewrite, repeat, and then revise a few more times. AB: I’m reading about vertebrate paleontology and proteomics, and thinking about horses, war, arrogance, aspiration, rivalry, evolution, and lots of other fun 19th - 21st century things. I guess I should say I’m working on a new book but that’s about as far as I can go without saying too much. AB: Don’t do it unless it’s a compulsion.